President John F. Kennedy rides in the limousine in Dallas minutes before the assassination. Bill Tracy ’64 remembers where he was 50 years ago on November 22 when President John F. Kennedy was shot. The Paul Revere-like announcement halted the lecture and prompted Tracy, his classmates, and the professor to turn on a classroom television. All stations were reporting on the shooting, though the footage was from moments before the tragedy. 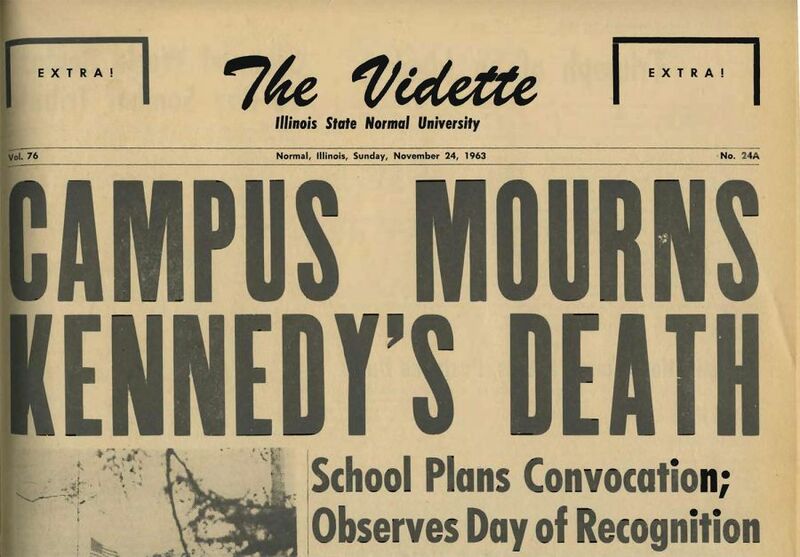 An extra edition of the Vidette released on Sunday, November 24. After class had been dismissed, Tracy crossed the Quad and headed to the Vidette office, where he had previously been editor, in hopes that there might be additional information. News had already spread to the other students, and the cool, gray, ugly weather seemed to reflect the mood that had swept over campus. 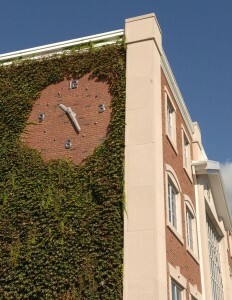 The Kennedy clock on the side of Schroeder Hall. Upon learning that Kennedy had died, administrators and student leaders were quick to cancel all extracurricular activities scheduled that evening and over the next several days, including Monday classes. 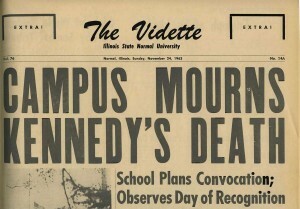 Fifty years have passed since the tragedy, but it has not been forgotten at Illinois State. Memorabilia from Kennedy’s campaign, inauguration, and other artifacts are on display in Milner Library in commemoration of the historic event. But even more prominent is the clock on the side of Schroeder Hall, which was dedicated to Kennedy shortly after his assassination. After half a century the clock continues to tick and serves as a reminder of what few are ever likely to forget. Were you on campus the day Kennedy was shot? Share your story in the comments section below. Steven Barcus can be reached at srbarcu@IllinoisState.edu. I was a freshman, waiting at the elevator on 9th floor Hamilton Hall in order to leave for my 1:00 p.m. Sociology class, when the news broke that President Kennedy had been shot. We went on to class, but our instructor dismissed us after sharing the news that the President had died. We crowded in the lounge to watch history unfold for the next several days! It was very sad to see his young widow, little Caroline and John-John, and extended family bravely face the tremendous crowds wherever they went. I had just finished having lunch in Fell Hall dining room and was in the lounge talking with my fiance who was a Fell Hall resident when a friend came up from the TV room (I think it was called the porthole) and announced Kennedy had been shot. We thought it was an attempt at bad humor...but soon it was confirmed. I walked to Schroeder for my one o:clock class and found all classes had been canceled for the afternoon. People were distraught and weeping on the quad....it was evident all had been affected by this national event.